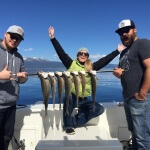 Report: The last 2 weeks on Lake Tahoe, Family owned and operated Eagle Point Sport Fishing has been fishing everyday that the weather allows. 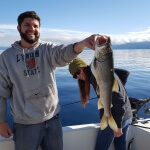 We are jigging for Lake Trout (Mackinaw) landing on average 10-20 fish a trip between 2-6 Lbs. and awaiting the return of the Kokanee Salmon. We should start seeing the salmon in the next few weeks as some have already been caught out in deep waters around 25 feet down. 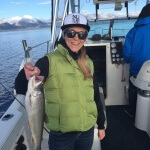 When the salmon do return we will be fishing for both the Kokanee and Mackinaw. Here are a few pictures from a couple trips this week. To make reservations give us a call at 530-577-6834.